So in continuation of staying crafty and active with projects that inspire me....use my abilities...get me off the couch and into life.... I now really need to make one of these for my house (see picture below). I fell in love the moment I saw it and knew exactly where it would look amazing. I plan on hanging it above the desk (pictures forth coming), in the little nook of the living dining kitchen in the Man's and I loft. With our 20 foot loft ceilings, art needs to be impactful, bold and to scale with the expansive space. And what better art than something of your own?! Since the space I want to put it skinner than this, I was thinking of rotating the canvas so it is an up and down rectangle verses a longer flatter one. I love the muted tones in the lettering....but thought maybe doing some thing bolder would help make it my own. Maybe certain words in a contrasting color to stand out, cause drama - impact. I am really hoping it turns out 1/5 as good and that I love it as much I do here. 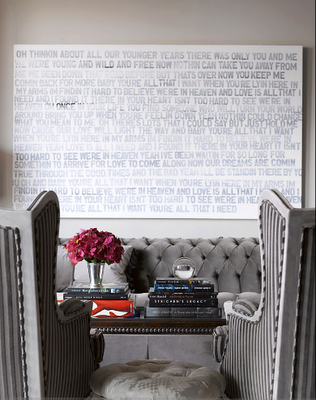 And PS - those wing back chairs are to die for!!! I would love to have a reading corner with one reupholstered in a graphic modern print....Christmas gift anyone? !